Last night I went to the beach to see the sun go down. My husband and I drove to the ocean in nothing but flip flops and light summer clothes. The car thermometer was still reading eighty five as we approached the Golden Gate Bridge. Finally, when we parked the car, the temp had come down somewhere in the seventies. I grabbed a scarf, removed my flip flops, grabbed his hand, and wandered down the beach towards the waves, toes squishing in the warm sand. We dipped our feet in the ocean and watched the waves get larger. The sun went down just like you’d imagine a summer night’s sky—fiery red with bits of orange and gold lining the clouds. We stood there waiting for the sun to finally tip its hat and dip under the horizon. We spotted dolphins playing in the waves. Dolphins. Because, clearly the beautiful sunset and the early fall beach night wasn’t epic enough. Dolphins. Not kidding. Just three little dolphins kicking it in the sunset like it’s no big deal (you can sneak a peek of this beach-y sunset on Instagram–although, my iPhone couldn’t quite capture the magic). The moral of this story is: It’s still pretty much summer and I’m eating pumpkin pie. Also, dolphins!?! Nature is a gross show off. Even though I’m wearing shorts and sweating like I’m on some sort of Cabo Spring Break ’03, I’m still trying to make fall happen. I think we can all agree that there is no better way to force fall into existence than to crank up your AC, preheat your oven, and bake the living heck out of some pumpkin pie. Hell, throw some chai into the mix. Make things extra cozy. This will probably prompt the weather to catch up with you, right? No. Well, at least we have pie. Pie that we can eat cold out of the fridge for breakfast whilst shvitzing. Extra coconut whipped cream please. Can I order a side of dolphins? Probably, yes. 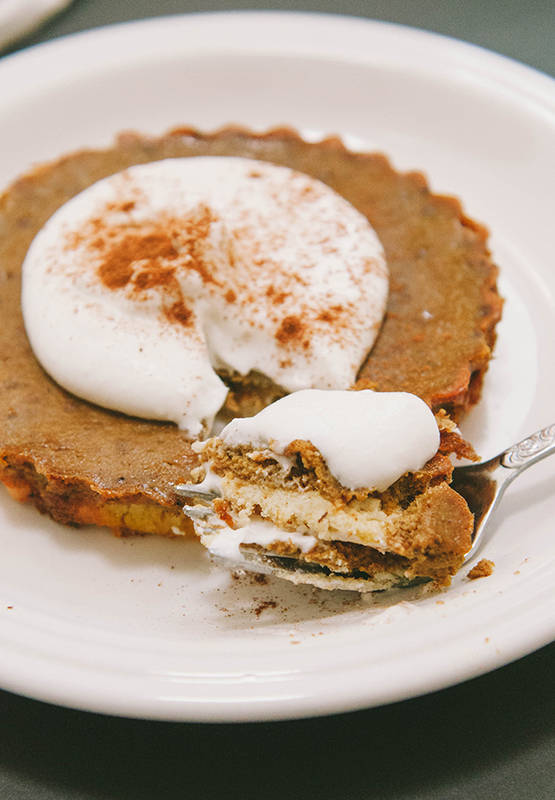 Last year I made you this Gluten-Free Pumpkin Pie With Buttermilk Crust. And, while I still maintain that the pie is UHHHH-MAYYY-ZING, it’s not exactly the easiest or the healthiest of treats. I wanted to make a pie that exuded little effort. It’s hot here. I’m already glistening, I don’t need to laboriously knead pie dough. That’s not going to do me any favors. Instead, I went for a no-knead, no-grain, no-problem crust and a low maintenance filling that’s spiked with a hit of chai. Don’t worry, we’re doing it right. I’d also like to publicly declare my love of tartlets. Who knew that these little tart pans could bring me so much joy? First off, they are smaller than a whole pie, so it makes you feel completely justified to eat an entire tartlet like it’s a gosh darn snack. Secondly, they are cute as heck. You know how when you go to a hotel and they bring you room service, and with that room service is the worlds tiniest bottle of ketchup and a Tabasco sauce made to fit inside a doll house? You get kind of angry because you feel like someone is limiting your ketchup intake, but also can’t help but kind of fawn over the size of these bottles. You end up taking a photo of the Tabasco next to your finger (for scale) and send this picture to your best friend with seven baby emojis. Well, that’s kind of how I feel about tartlets. Except, maybe not at all. But, sort of. Should we just talk about dolphins again? I feel like that was better. DOLPHINS. In a food processor combine the ingredients for your crust. Pulse together until a dough forms. Using clean hands, portion out the dough into six even portions and press each portion evenly into the bottom of your tartlet pans. 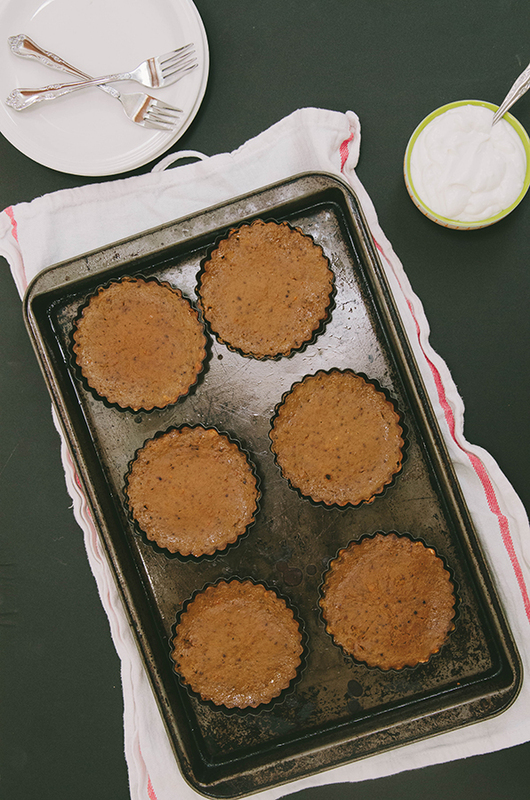 Place your tartlet pans onto a baking sheet. Set aside. Wash out your food processor. After it is clean combine all of your filling ingredients and process on high for a minute or two (or until completely combined and smooth). 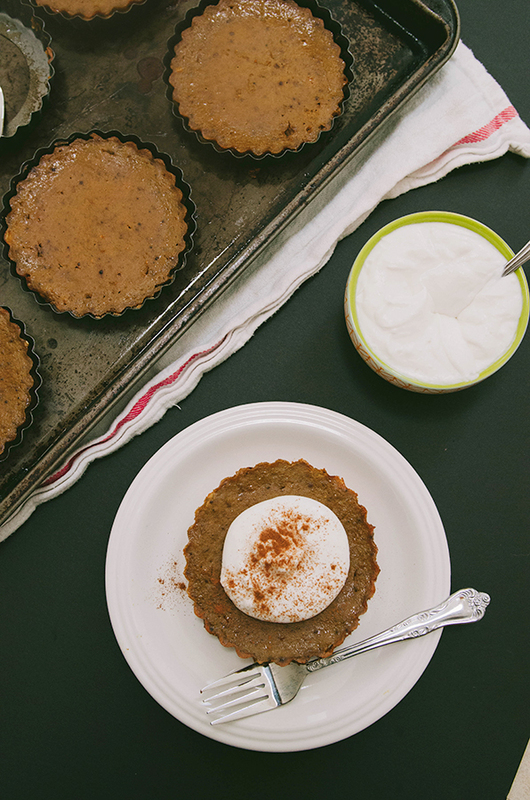 Pour the filling evenly into each tartlet until you no longer have any filling left. Carefully put the pan containing your filled tartlet pans into the oven and bake for 45 minutes, or until the custard sets up. Refrigerate the pies for an hour or two before serving. To make the whipped coconut cream open up a can of coconut milk that has been refrigerated overnight. It's contents should be thick and white. Scrape this thick layer of cream that has separated from the liquid into a mixing bowl. Do not pour in the liquid. This is coconut water. You can save it for later or discard completely. Add the maple syrup to the coconut cream and using a hand mixer, beat the coconut and maple syrup mixture until it's fluffy and resembles whipped cream. 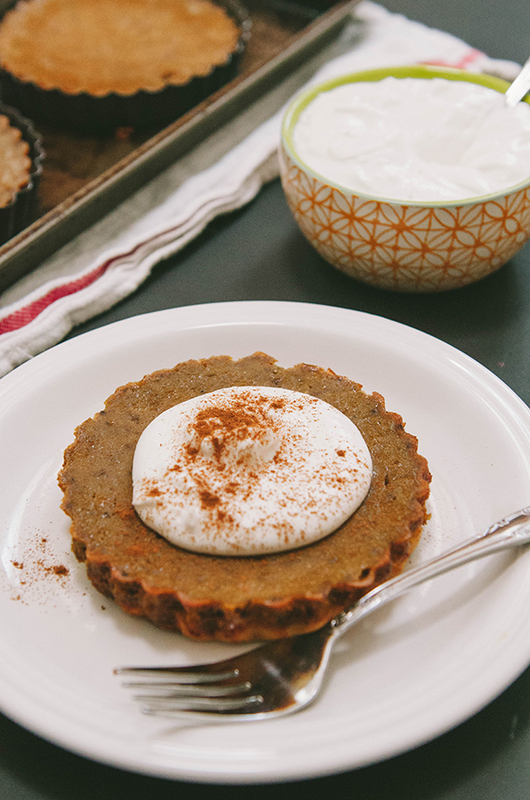 Serve the chilled tarts with a large dollop of coconut whipped cream and a dusting on cinnamon. Enjoy! These look soooooooo good! Love the pumpkin and coconut combo! this looks ridiculously delicious. I do not have a food processor. Are there other appliances I could use to make the crust and the filling? I do have a vita mix. Would that work for the filling? Could I make the crust by hand?